Lebanese will have a first opportunity in nine years to vote in a general election on May 6 under new rules, expected to bring some changes to parliament but preserve a unity government combining its main political blocs. A smooth election and the swift formation of a new government are not only important for Lebanon’s political stability but also to bolster a weak economy that is in dire need of reforms and investment. The new voting system has generated uncertainty in some districts, but Prime Minister Saad al-Hariri, a Sunni Muslim, looks likely to form another unity government that includes Iran-backed Shi’ite movement Hezbollah. WHO ARE THE LIKELY WINNERS AND LOSERS? Though Hariri is expected to remain the biggest Sunni figure in parliament and keep his job, many analyses predict his parliamentary bloc will lose seats. Hezbollah, which is heavily armed, may emerge stronger, though there is little prospect of it and its allies securing the two-thirds majority needed to dominate the state. Hariri has called for a new government to be formed swiftly to press ahead with reforms to put public finances on a sustainable path. Otherwise donors may withhold $11 billion in soft loans pledged in April to help revive the economy. Most parties in Hariri’s coalition government are likely to rejoin, but those which win more seats may demand more posts in cabinet or more important portfolios like the finance ministry. WHAT’S CHANGED SINCE THE LAST ELECTION? Last time Lebanese voted for a new parliament in 2009, Hezbollah and its allies campaigned in a “March 8” bloc against Hariri and his allies in a “March 14” bloc. The two blocs argued mainly over Hezbollah’s big arsenal of weapons. Syria’s civil war from 2011 aggravated Lebanese political divisions and led to years of paralysis. Hezbollah grew stronger as it deployed in Syria. “March 14” meanwhile gradually disintegrated as it stood powerless in the face of Hezbollah’s military power and as Hariri’s main backer, Saudi Arabia, turned its focus elsewhere. Hariri, who spent years abroad on security grounds, had to compromise and in 2016 struck a deal that made Hezbollah ally Michel Aoun head of state, while Hariri became prime minister. The issue of Hezbollah’s arms has in effect been shelved for now. Instead, concerns about the economy and coping with some 1 million Syrian refugees have taken center stage. HOW DOES LEBANON’S SECTARIAN SYSTEM WORK? Lebanon splits power among religious groups according to quotas adjusted at the end of the 1975-90 civil war. The president is always a Maronite Christian, the prime minister a Sunni Muslim and the parliament speaker a Shi’ite. 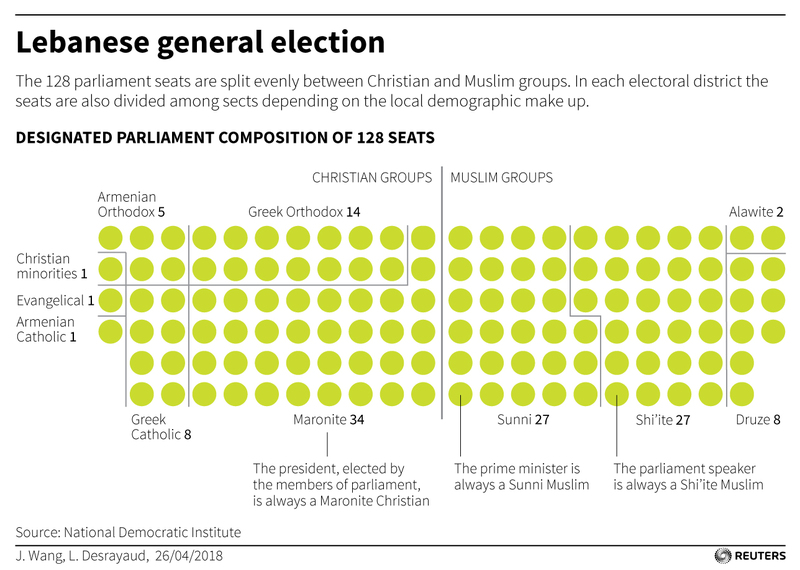 In parliament, the 128 seats are split evenly – 64 for Christians and 64 for Muslims including Druze, with the two halves further divided among 11 total sects. Each electoral district has seats apportioned according to its demographic makeup. 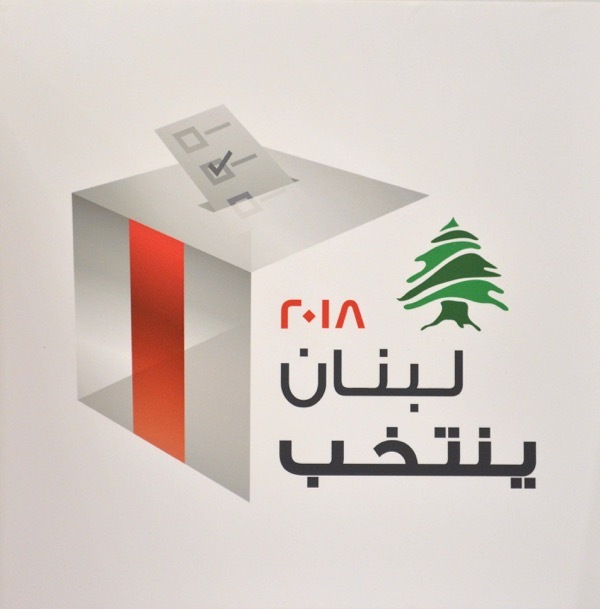 Lebanon’s main parties are sectarian, but for elections they create tactical alliances across religious lines to form joint candidate lists for each constituency. Disagreement over the electoral law was the main reason elections were delayed three times since 2009. In the past, voters would could cast a vote for each seat in their district, with winners decided by a majority. Christians disliked that system because it gave Muslim voters great sway over which Christian candidates won seats. Independents disliked it because it favored established political powers. A new law was finally agreed last year, with a compromise requiring voters to choose both a favored list and a preferred candidate from it, with seats awarded under a complex formula. Some critics say the new system still favors traditional local bigwigs. However, it has introduced uncertainty in some districts and produced an array of alliances at a local level. President Aoun’s Free Patriotic Movement, a Maronite party, shares a list with Hariri’s Future Movement in some districts and with Hezbollah in others. In Beirut, independents running against the political establishment did well in local elections in 2016 and might win seats, although the voting system is still stacked against them. Individuals could submit their candidacy for parliament until midnight of March 6, 2018. 976 candidates were registered, including 111 women. Candidates were obliged to join lists, which had to be finalized by March 26, 2018.